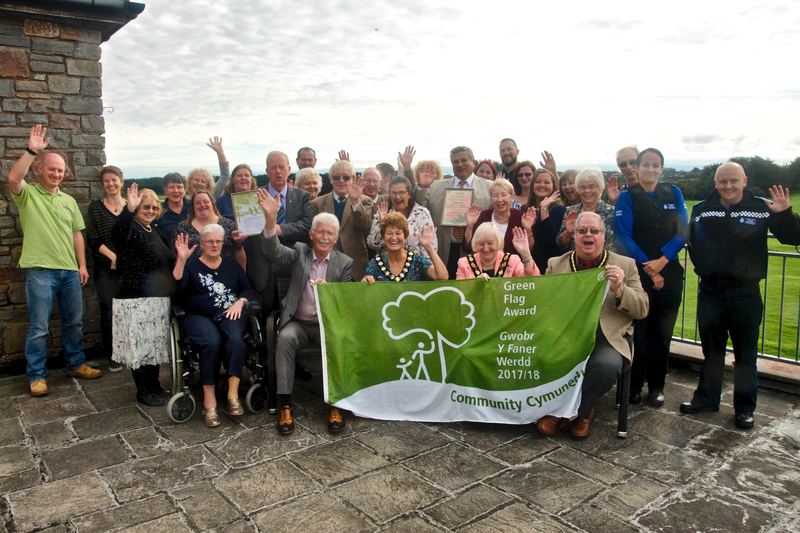 The Wilderness Allotment Association, Porthcawl has been recognised for its work in the community with two awards at a well-attended presentation ceremony at the Grove Golf Club, Porthcawl. The event was chaired by Ken Whyte, Chairman of the Wales Allotment Society and also Bridgend County Allotment Association (BCAA). The National Allotment Society (NAS) nominated the Wilderness for a prestigious international allotment award issued by the Council of Europe (COE) which comprises 47 countries across the continent (not the same as the EU, which meant 'Brexit' was never mentioned once at the event!) The COE is behind the International Court of Human Rights and each year it organises a pan-European week of events in October. The citation for the Wilderness acknowledges the allotment's:- "Engagement in community life." Cllr. Pam Davies, Mayor of Bridgend County Borough Council (BCBC) accepted the European Award on behalf of the Wilderness from Mike Thurlow, Gardening Consultant for the NAS. In addition, the Wilderness Allotment Association achieved another Green Flag Community Award from Keep Wales Tidy for being a: "Quality green space." Cllr. Norah Clarke, Deputy Mayor of Porthcawl Town Council, accepted the Green Flag Community Award from Lucy Prisk of Keep Wales Tidy. Both local dignitaries congratulated the Wilderness Committee and felt the awards reflected well on Wilderness Allotments, Porthcawl and Bridgend County. Ken Whyte added that it was the second time that one of BCAA's sites had won a European Award (the first was Bronfair in Maesteg some years ago), and that getting two European awards in Bridgend County says much about the BCAA/BCBC allotment partnership. He went on to say that it is quite an achievement in itself, when one considers that the population of the 47 COE countries is about 800 million and there are many thousands of projects from which our two allotments were chosen. During the joint presentation, examples were given of some of the Wilderness' projects and partners over the years: Porthcawl Museum (WW2 VE & VJ garden, Somme Commemorative Display); The Wilderness (coppicing, hurdle-making, bird boxes); Bridgend College (Gardening for young people with autism); Heritage & Natural Environment Interpretation - launch of Ceidwad Y Llyn chainsaw sculpture (Dan Lock, poet & artist). The first project dates back to 2012 with the creation of a community/disabled plot with grant-funding from BCBC, BCAA and Bridgend Association of Voluntary Organisations (BAVO), to the most recent project where the Wilderness is helping BCBC to create a dementia-friendly garden in a residential care home. Although the Wilderness' community/disabled plot suffered an arson attack in December 2014 the facility was restored with donations through an appeal launched by local media The allotment's next step is to build a disabled toilet for which Planning Permission has been obtained. In keeping with its innovative approach, the allotment is working closely with Sustainable Wales (Environmental Charity) on minimising the carbon footprint of the disabled toilet and energy-saving features such as harvesting rainwater for flushing and installing solar-powered lighting. Over the years, the Wilderness Allotment Association has worked with residents, Town & County Borough Councillors and organisations drawn from the private & public sectors such as Probation, Social Housing, Voluntary Sector, Social Enterprises, local companies ranging in size from sole traders to large civil engineering companies. The European Award recognises the diversity of these partnerships and that they are all based on principles of Democracy, Human Rights and the Rule of Law. In this way, the Wilderness Allotment Committee feel that its work is part of the glue that holds the social fabric of our communities together, and that the European and Keep Wales Tidy awards recognise the good work of our partners and supporters, just as much as the allotment itself.